Revenge may never get old,but often times it doesn't innovate much either. 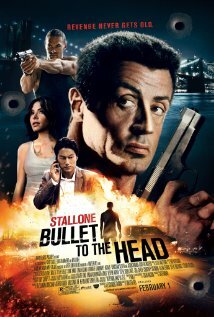 Hot on the heels of The Expendables , which proved that all the "old boys" still had what it took to have a box office presence, Sylvester Stallone appears in another action flick without the rest of the gang. Does he still have what it takes? James Bonomo (Sly) is a hitman. Him and his partner are hired to off someone, as is usually the case with hitmen, and after a successful job the two are waiting for payment at a bar when Keegan (Jason Momoa) shows up. Short story shorter, Keegan kills Bonomo's partner, and makes himself an enemy in Bonomo when he fails to kill him as well. Later at the morgue, we are introduced to our other main character - a cop named Taylor Kwon (Sung Kang) who happens to have been ex-partners with the man Bonomo killed. Thus our revenge plot begins proper. The story here is as thick as it needs to be, meaning that if it where ice on a lake you really wouldn't want to be walking on it. It essentially boils down to a criminal who's been paying people off trying to cover all his tracks, and it goes wrong for him when he crosses the hero character. There's some bits thrown in that could make a person argue over depth - a few moments debating morality as Kwon and Bonomo tend to have different ideas of how to deal with problems (take them in opposed to take them out), and there's a brief moment where Bonomo gets into parenting (or lack thereof). Being that this is a straight up action flick, very similar in format to the good old days, it leaves a bit to be desired by anyone who isn't already fans of that type of flick. The action scenes play off very well as far as choreography and actual action, and the plot never get's too convoluted so it's easy for anyone to follow the reasons the story progresses the way it does. One liners are found throughout, although I would wager to say not nearly as many as those that came out of the eighties and nineties. "...they don't necessarily stick out as well as more iconic characters..."
Characters are pretty two dimensional, and although they still feel unique from each other over the course of the movie they don't necessarily stick out as well as more iconic characters such as Terminator, or Walker Texas Ranger . They are entertaining enough to watch on screen, and the acting job is done relatively well (although there are a few dry spots), with the only major attempt at fleshing out a character being on behalf of Bonomo when his daughter comes into play in the movie later. Audio quality is top notch, although this is Stallone , so some people will have a hard time understanding the poor fellow. Soundtrack is a pretty driving thing during the movie, but it's nothing that sticks with you or overrides what is happening on screen. That being said, there is a few racial quips in the dialogue between Bonomo and Kwon - nothing that the average person should really get the underpants in a twist about, but these days there does seem to be a lot of folks who call foul on anything and everything, so I feel it should be mentioned. Overall, it's an enjoyable action movie, but that's really it. It's got good action scenes, including a ax-fight between Bonomo and Keegan at the end, and a consistent (if not a bit shallow) plot. It tries a bit to add depth to the characters, but never so much so that it degrades from the overall being of an action flick. If you are willing to watch a rather normal action movie that doesn't really try to re-invent the wheel, you'll probably enjoy it as much as I did.